Recently I had the pleasure of working with a really great Irish couple from Australia who married in Spain. Both Maire and Billy are living in the sunny city of Brisbane in the East coast of Australia and wanted a destination wedding that would be easy for their guests mainly in Ireland to attend, but still had the sun, fun and excitement of their home town. Needless to say, Marbella was their first choice. It had everything they were looking for for their wedding in Spain; it was central to their family and friends around the world, it had amazing scenery, over 300 days of sunshine a year and of course the number one requirement for all sun-loving in Oz – it has spectacular beaches! Because of the distance from Australia to Spain, Billy’s mother and aunty initially came on their behalf and met up Sunshine Wedding’s planner Scott, who took them to some of the best Beach Club wedding venues the South of Spain has to offer. 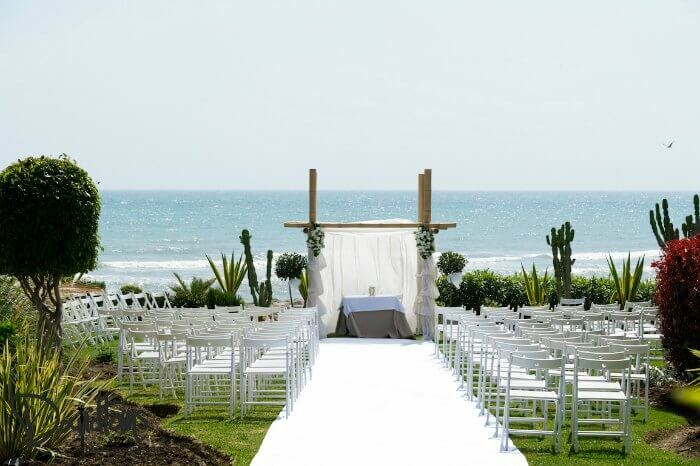 Andalucia offers every kind of beach-side wedding venue you could imagine …from rustic Chiringuitos with their Caribbean laid back, chill out feel; to luxury 5 star resorts complete with large swimming pools, manicured lawns and your own private beach. Luckily Scott’s suggestions were spot on, and through their family’s feedback the couple booked the beach clubs of their dreams in Marbella and Estepona. The evolution of technology means that wedding planning has become so much easier for couples wanting a destination wedding abroad, but who live so far away from their chosen country. Luckily Maire and Billy had two years to plan their big day and many Skype calls took place between Scott and the couple where they could see suggestions and meet everyone involved in their big day via a video link. Scott talked them through various options of suppliers based on the couple’s requirements, and the process was both seamless and fun for all involved. The couple loved David Toms photography, having spent many a night flicking through the photographer’s website, and they knew he would be the ideal man to capture all the special moments of their big day. And because of Videographer Sam’s experience of working with David, and their fantastic creativity and past successes together, Billy and Maire booked him to produce their wedding short movie and highlights of their special day. Finally the month of the wedding was upon them and Maire and Billy arrived at Malaga airport a week before the big day, raring to go and eager to finally visit their chosen venues in person. It didn’t take long for Scott to put their minds at rest that their day was going to be as perfect as they had been planning the last two years. It was a busy week of appointments, where the couple got to meet all their chosen suppliers and make last minute decisions on the finishing touches for their day, as well as their pre-wedding and post-wedding celebrations. Come back next week and discover what exciting things the couple planned for their Marbella wedding day– and how guests enjoyed their last days in Andalucia after the wedding day was over.